UPDATE January 17, 2018: Vinnie Spina became the publicist for RHONJ cast member Siggy Flicker and using the same trolling tactics. I was very surprised when I discovered Vinnie Spina and her husband Patrick ran for public office this summer. 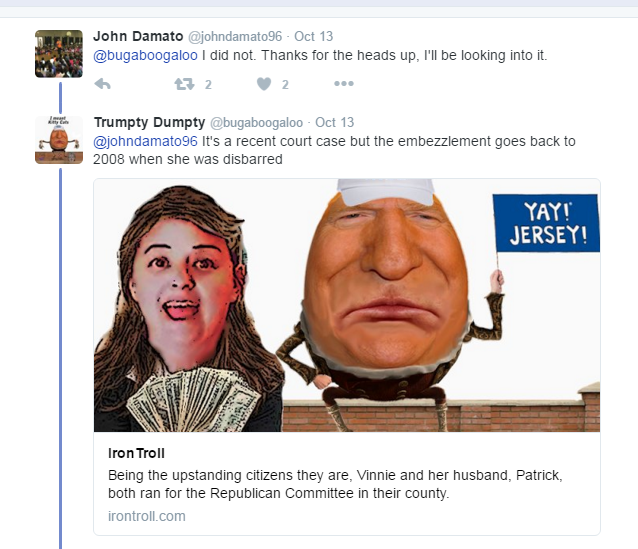 On the other hand, being candidates for the New Jersey Republican Committee officially made them public figures, so their days of claiming harassment are over. The Supreme Court has made it pretty clear that bloggers can write about public figures and bring up topics that are of public concern. 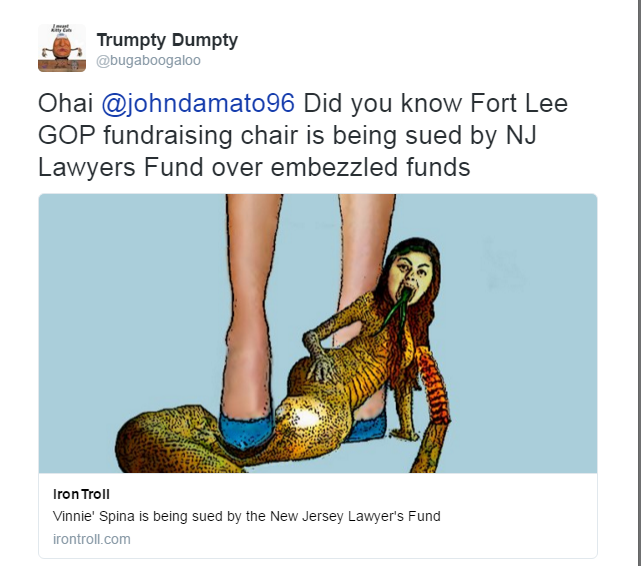 I was even more surprised when I found out Vinnie Spina was Fund Raising Chair for the Fort Lee GOP. 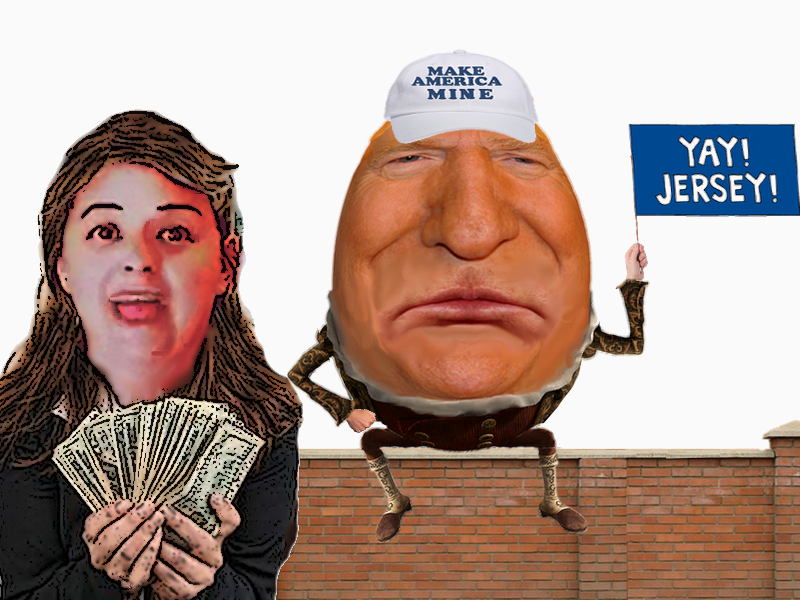 The woman is currently being sued over misappropriation of funds (embezzling) and she's in charge of campaign funds? Are you kidding me? I decided to ask a few people about this. I'm not sure what I expected, but the responses were unusual. I left a message about Vinnie on the Fort Lee GOP facebook page. They deleted my comment and removed Vinnie's name from their website. I don't know if that means she was removed as Fund Raising Chair though. Vinnie was appointed to the chair position by Judith Fisher, the wife of Fort Lee Republican Club president, Eric Fisher. I tweeted her Twitter account about Vinnie and she deleted her account. I did get a response from council candidate John Damato. 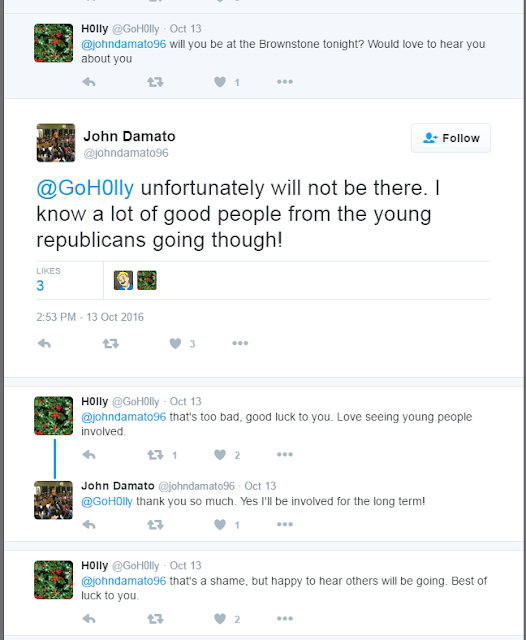 Damato is a 20 year old conservative and one of the two GOP candidates for city council. He was concerned about Vinnie's behavior and issued a statement denouncing her actions. 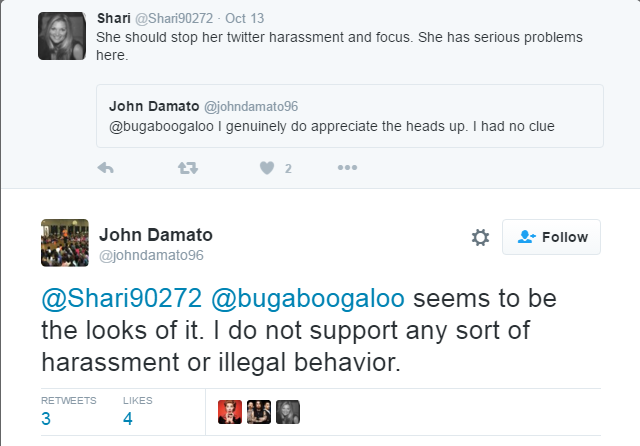 He later deleted that tweet after being harassed. After our short conversation, which is posted below, Mr Damato was trolled by Vinnie aka @A1_Buckwheat and her friends, including Brandon King aka @TehBanHammer, before his account was suspended. Some of their tweets are below. 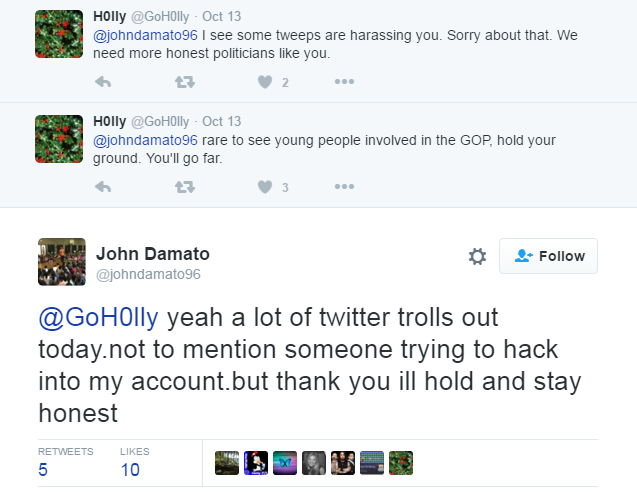 They kept Damato tagged into their conversation for quite a while and even taunted him about his recently deceased mother. Keep in mind that Vinnie and Damato are both Trump Republicans in Fort Lee. 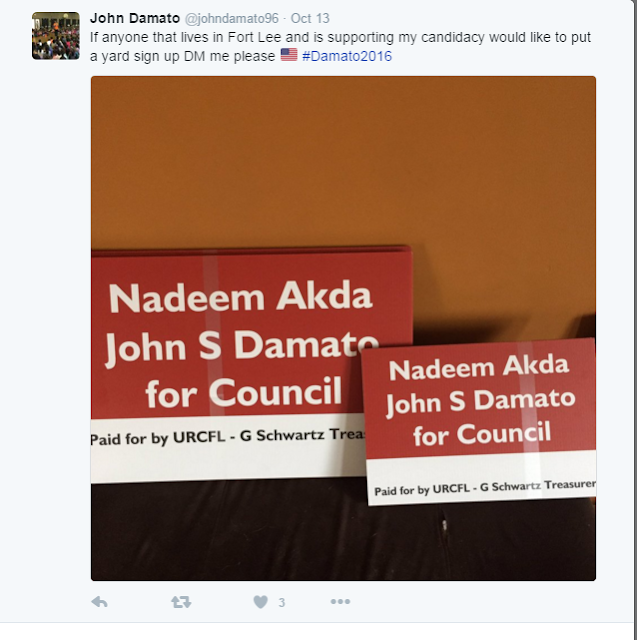 Damato was one of the candidates for whom the fund raising committee, chaired by Vinnie, was raising funds. 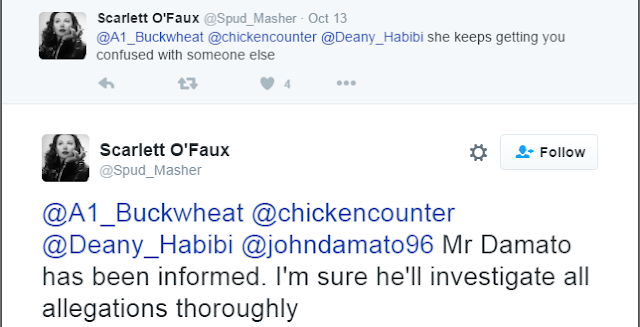 @TehBanHammer @A1_Buckwheat @chickencounter @Deany_Habibi @johndamato96 @DeadFleabag @ErrTeefNotFound I'm sure he will. @TehBanHammer @Spud_Masher @_KingCock_ @A1_Buckwheat @Deany_Habibi @johndamato96 @DeadFleabag @ErrTeefNotFound he needs teeth whitener. @TehBanHammer @Deany_Habibi @Spud_Masher @_KingCock_ @A1_Buckwheat @johndamato96 @DeadFleabag @ErrTeefNotFound Shari's new thang. @evsmom @A1_Buckwheat @Spud_Masher @Deany_Habibi @johndamato96 and I was going to vote for him. 😂 I'm calling his mom. @evsmom I would say so. Not very councilman like. I wonder if his opponent knows? 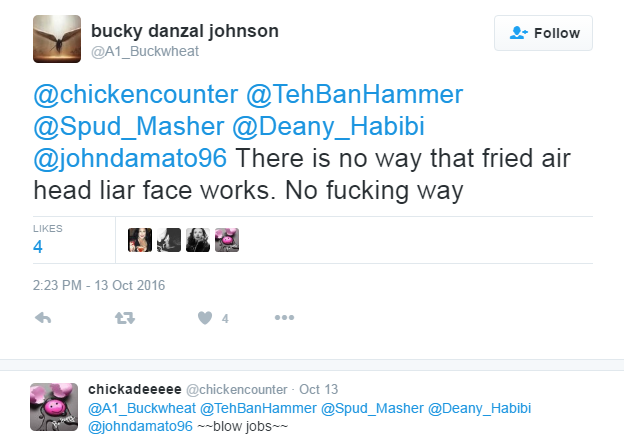 @TehBanHammer @Deany_Habibi @chickencounter @A1_Buckwheat I think @johndamato96 's statement has been taken down... Oops..
@Spud_Masher @TehBanHammer @Deany_Habibi @A1_Buckwheat @johndamato96 Oopsie! @Spud_Masher @TehBanHammer @Deany_Habibi @A1_Buckwheat @johndamato96 I think this information should be provided to his opponent. 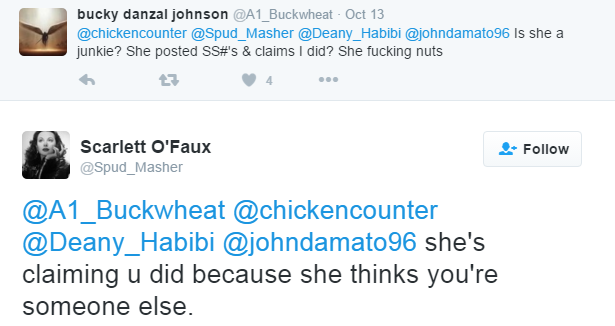 @Spud_Masher @evsmom @TehBanHammer @Deany_Habibi @A1_Buckwheat @johndamato96 I'm starting to feel really bad for his mom. @SecretTruth_10K @evsmom @chickencounter @TehBanHammer @Deany_Habibi @A1_Buckwheat he's just young.